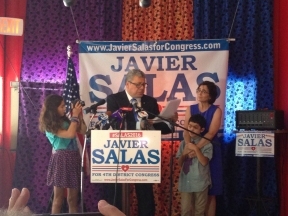 Radio Host and Former Senior Advisor for Governor Pat Quinn, Javier Salas formally announced his campaign to run for the 4th Congressional District of Illinois, this week at a kickoff event at La Catrina Café in the Pilsen neighborhood. 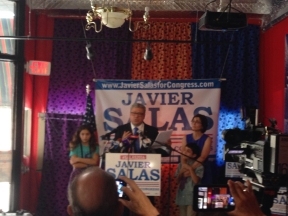 “I will be a Congressman who will fight for hard working families. Too many young people have a grim future because of a lack of jobs, education and/or immigration status—we need to change that. We need to make Washington work again by bringing new ideas to create jobs, provide better education opportunities for everybody and finally obtain comprehensive immigration reform. “As a dedicated family man, I have enjoyed a successful career as a community leader, media personality, and passionate advocate for working families. As a trusted advisor to Illinois State Governor Pat Quinn, I implemented plans and programs to benefit hard working people and immigrant communities through expanded job opportunities, affordable healthcare, quality education and improved school programs. “I am planning to work for and within my District. Families need a full time Congressman who will focus on a variety of issues. Twenty two unproductive years of previous representation is not fair for our families and it is not right for our kids. We need to change course,” said Salas.